If you happen to know any Brazilians leaving abroad, ask them to name the five foods that they miss the most. I’m willing to bet that “pao de queijo” (little cheese bread) makes the list. Some might even shed a tear or two thinking about it. Originally from the beautiful state of Minas Gerais, they are made with a farmer’s type cheese, quite unique (Minas’ cheese, read about it here). Brazilian cheese bread is so popular that nowadays you can buy it in stores all over the country called ‘Casa do Pao de Queijo” (Home of the Cheese Bread), or as a dry mix, in colorful bags available at most grocery stores. I’ve lost track of how many such bags we’ve stuffed in our luggage coming back from annual trips to visit family and friends. Add all ingredients, except those for the topping, into a blender. Blend very well at full speed, stopping a couple of times to scrape the surface of the blender’s cup, making sure no bits of tapioca starch are left unmixed. The mixture will be a little thinner than pancake batter. Pour the batter in mini-muffin tins, to no more than 3/4 of their capacity, as shown here. The recipe makes 24 little cheese breads. Add a little bit of salt and rosemary on top, place in a 400F oven, and cook for 20 minutes. Most will come out right away without sticking. If some stick slightly, allow them to cool for a few minutes and probe them out gently with the tip of a knife. Comments: In the original recipe, Neide was trying to mimic little cheese breads she had at a restaurant in Rio de Janeiro. She used exclusively Parmigiano cheese in the batter. I’ve made this recipe many times, and now settled on a combination of two cheeses: a melting type, preferably Mexican, and a small amount of Parmigiano to sharpen the taste. Of course, depending on the type of cheese, adjust the salt. In this batch I did not add any rosemary, but please do so, it is perfect with it. They resemble popovers in texture, but are gluten-free, so folks with gluten allergies can still enjoy them! Now, allow me to share a couple of photos sent by Mia, a reader of my blog who just made a batch! In her version, the mixture ended up with a firmer texture, so she was able to roll them as little balls, which I must say made them a lot more “authentic-looking”. Awesome job! 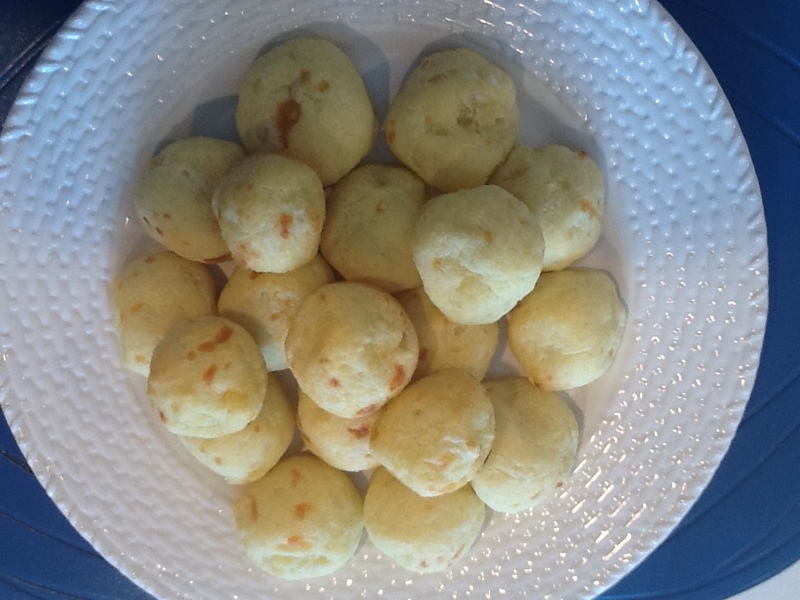 Mia, thanks so much for trying one of my favorite Brazilian recipes, and for sending the photos and allowing me to publish them… Now I am craving “pão de queijo” again…..
« CAULIFLOWER SOUP, All Dressed Up! 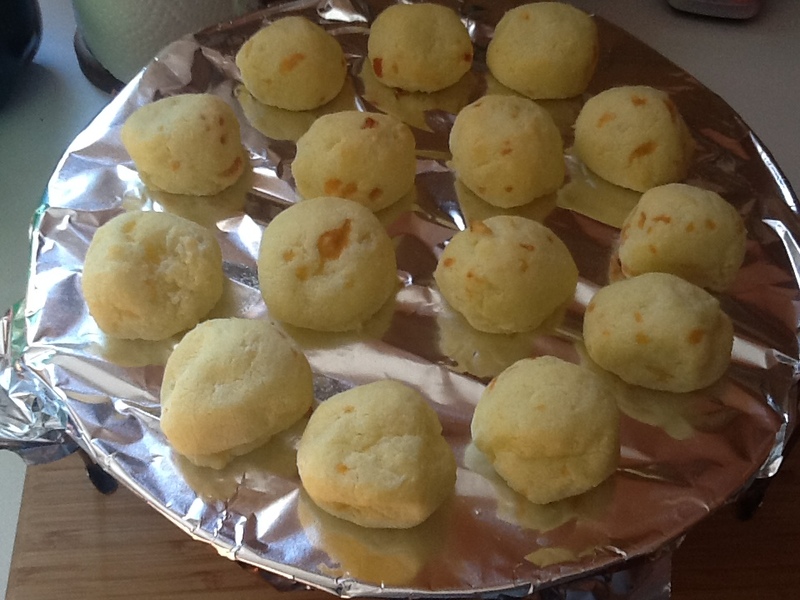 I tried pao de queijo in a Brazilian restaurant here in Firenze and wondered how it was made. (but forgot to search the recipe once back home 🙂 ). Thanks for sharing this recipe, I’ll surely try it. A Brazilian restaurant in Firenze! Maybe one of those barbecue places “rodizio-style”? Mmmmh! Brazilian barbecue is awesome… what the hell do you do to meat to have it so juicy? We have a pay-per-weight Brazilian restaurant in Firenze. You stuff your dish with any kind of delicacy at the buffet and you pay a fixed per gram rate. I would use a Monterey Jack type… melts well, clean taste. Mozzarella might work well too, but I would use the low moisture kind, not the fresh one, packed in liquid. Hope you will love these! If yours stuck too much, grease the tins a little bit, should work fine. Glad that you enjoyed them! I just made this and it did not come out as pretty as yours! I will try the blender technique next time. Hi! My parents are Brazilians and have several Brazilian friends living here in Canada. I have a slightly different recipe for pao. Put tapioca flour into a mixing bowl. Heat the wet ingredients (excluding the eggs) until they reach a full boil. Pour over the tapioca flour and mix well to form a sticky dough. Mix in the cheese well. Allow the mixture to cool slightly before adding the eggs as you do not want the eggs to cook in the hot batter. When the batter is cooled enough mix in the eggs. With greased hands form 1/4 cup sized balls and space evenly on cookie sheet. Bake 20 minutes or until golden and puffed up. Thanks for posting your recipe, I am going to try it as soon as possible and let you know how it goes…. This is unreal! I just left a comment on your site, EXACTLY as you are leaving a comment on mine! I really missed Pao de Queijo after leaving Brazil and had to come up with my own recipe but I never thought to use any water and I’m not sure you haven’t got it nailed here! Incidentally, have you ever tried adding a little chopped tarragon to the batter before baking? It goes superbly with the cheese! Old post but worth a mention…use coconut oil instead of vegetable oil! 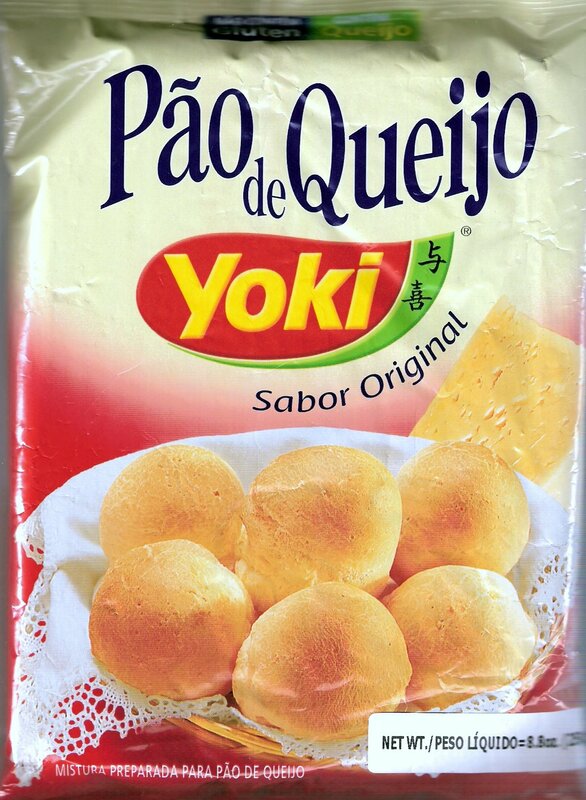 I’ve come across pao de queijo twice. Once, unsurprisingly, at the pay-by-weight Brazillian barbecue buffet in Woburn, MA. They’re really good as part of mini-steak sandwiches with their spit-roasted beef. The second, more surprisingly, is at The Reel Club (http://www.reel-club.com/) in Oakbrook, IL, where their gluten-free nature seems to be a big plus. They may be served at the bar only. There’s oddly no acknowledgement of their Brazilian heritage. you’ve got the answer! Looking forward to your report on these babies! Thank you. I hope to be able to make a batch soon. Sally, I made a batch today and if they’re supposed to be a cross between a popover and a gougere, they were a success. Not the pretty rounded balls that yours are, unfortunately. Thank you for the recipe and advice. I tasted both the 20 min version and the 25 min one and they were both gummy, but the bottom of the batch with the shorter baking time has a softer bottom which I think meant that it was a bit under baked. I removed the mini muffin tray from the larger baking sheet that it was sitting on, in case of overflows etc, before baking for an extra 5 minutes, and the result was a nice crispy and somewhat more golden base. As you can see if you go to my LJ, the picture of the inside shows that it’s still ‘moist’. I’ve seen pictures of inside of these breads and some of them seem quite bready so I was concerned that I had done something wrong when I saw the empty space in the middle. Or is it because of the blender batter technique/recipe compared to the recipes which end up with balls of dough which you bake on a baking sheet? I love these little breads! I would eat them every time I visited Brazil. Thanks for the recipe! Complimenti!! Non vedo l’ora di provarli!! 1) The recipe says. “Farmer Cheese,” which I bought in packaging that makes it seem like cream cheese but your text says to consider Monterrey Jack (which I may have). Do I have the right farmer cheese relative to your original recipe? And is the jack sufficiently superior that I should return the farmer cheese? 2) How long before baking can I make the batter? And how long will the pao remain good after baking? I tried this recipe, but instead of putting ingredients into a blender I dumped the tapioca flour in a pot with the warm milk and oil mixture. The result was far from runny. It was dry enough I could shape balls with it. It looked like a proper dough and when mixed with the egg, it acted like proper dough. I made the mistake of preparing this with olive oil. At the end, the balls looked beautiful and golden, but wherent chewy inside (i like chewy) and tasted like olive oil more than anything. So sad 😦 I saved some of the dough. I will add a bit more milk and a lot more parmesan cheese. The white cheese doesnt cut it. It tastes much better when made with margarine as well. DONT USE OLIVE OIL! OR COCONUT OIL! I used olive oil, and 20 of us at our Olympics opening ceremony Brazil-themed party, thought they tasted superb! It seemed to me that the cheese used may be impactful. Thanks for the delicious recipe! AWESOME!!!! THANKS SO MUCH FOR LETTING ME KNOW…. I think a large egg or two small eggs will make the inside chewier as well. Ill have to play around with that. I used a small egg, and the balls weren’t chewy enough. I can tell a good cheese bread when I taste one! A while back I had some in a restaurant, and they were SO cheesey, fluffy, and goey/chewy and a bittranslucent inside. They were amazing. My cheeseballs turned out too tough. The ONLY problem with this recipe is that I can’t stop eating them until they are gone! I’ve loved these breads for so long and missed them dearly. Now I can whip up a super simple batch anytime I want. Thank you! I enjoyed looking at this recipe blog that had a Brazil taste to it.